In a large pot of boiling, salted water, cook the linguine until just done, about 12 minutes. 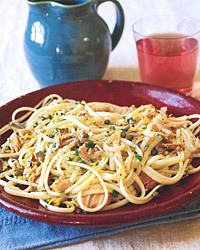 Drain the pasta and toss with the tuna sauce and parsley. Here we use tuna packed in olive oil, and we count on that oil as part of the sauce. If your tuna doesn't have at least one-and-a-half tablespoons of oil per can, add a little more olive oil to make up the difference. Of course, you can use tuna packed in vegetable oil, too, but avoid water-packed tuna at all costs. The flavor, and most of the nutrients for that matter, leach out into the water. A robust French rosé from the southern Rhône appellation of Tavel will serve these Mediterranean ingredients well. Earthy and full of roasted raspberry flavor, Tavels are among the most full-bodied of rosés. If you'd rather stick to the Italian theme, look for the wonderful Sicilian rosé from Regaleali.